1 - 08.30 Why duplex scans should be mastered by vascular surgeons, Enrico Ascher Start time : 0min.21s. 2 - 08.40 Drug eluted balloons. Concepts, products and how to use them, George Papandreou Start time : 12min.28s. 3 - 08.50 After one year, what are the results of DES? Koen Keirse Start time : 22min.20s. 4 - 09.00 Drug coated balloons. What are the specificities and clinical results? Frank Vermassen Start time : 31min.33s. 5 - 09.10 In stent restenosis: is DCB the ultimate tool? Giovanni Torsello Start time : 43min.23s. 6 - 09.20 What does "stent’s radial force" mean? Koen Deloose Start time : 49min.47s. 7 - 09.30 DES: what happen after 5 years. Are DES still better than bare stents? Michael Dake Start time : 59min.3s. 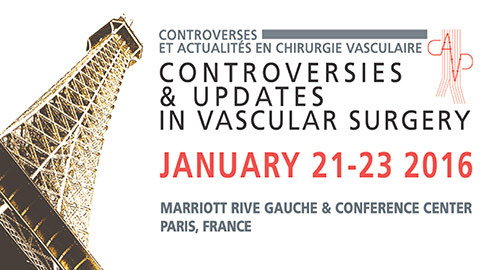 8 - 09.40 DES versus recent bare stents: is the drug more efficient than a placebo? Yann Gouëffic Start time : 69min.2s. 9 - 09.50 Discussion Start time : 77min.0s. 10 - 10.30 One day surgery for endovascular repair: basic requirements and patient’s selection. US experience, Peter Schneider Start time : 95min.40s. 11 - 10.40 SFA long lesions: which one can be treated endo and how? Koen Deloose Start time : 106min.0s. 12 - 10.50 BTK lesions: DEB or DES? Roberto Ferraresi Start time : 115min.48s. 13 - 11.00 Tibial arteries repair: when and how, Peter Schneider Start time : 123min.33s. 14 - 11.10 What can be expected of tibial repair in diabetic patients, Daniel Brandao Start time : 133min.35s. 15 - 11.20 Ankle approaches: material, techniques and some results, Roberto Ferraresi Start time : 142min.18s. 16 - 11.30 Is there a role for distal bypass in the endovascular era: lessons learnt from 15.000 procedures, Clement Darling Start time : 149min.30s. 17 - 11.40 Bypass in the leg after failed endo repair. Do the results compare to first line bypass? Julien Sfeir Start time : 160min.30s. 18 - 11.50 Follow-up of patients treated by prosthetic bypass of the lower limb, cost model evaluation at two years, Yann Gouëffic Start time : 168min.0s. 19 - 12.05 Industry symposia Start time : 188min.42s.